So the conversation to visit South Africa began in November 2016 with my friend Mosun. My initial plan was a West African road trip to Benin Republic-Togo-Ghana all the way to Ivory Coast. She suggested South Africa or Rwanda, finally we settled for South Africa. We started gathering visa application information, a travel agent was charging 160 thousand for visa alone and could not guarantee a visa. 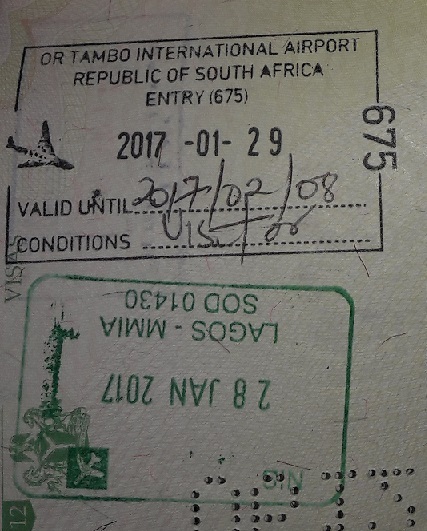 I reached out to Amara of Travel with a Pen who directed me to her post on South African visa application and who was available to answer all my questions regarding the visa application process. I got all required documents and submitted my visa application on the 18th of November, 2016 at the VFS Centre in Lekki. 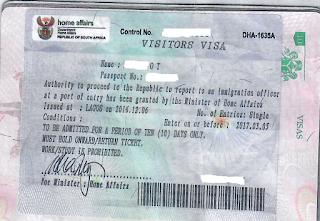 I picked my visa from the VFS centre 15 working days later (8 December, 2016). By this time, my friend Mosun has already decided she would no longer be going on the trip. Before my South African visa was ready, I also already made a decision to add Kenya to my itinerary. The weekend before I got my visa, I visited a wakanow office in Lekki and I got a ticket for about 158 thousand Naira but because I wasn't sure I would get a visa due to all the gist of embassy denying visa applications, I decided not to pay for the ticket. I found out in the office that Kenya had an e-visa option and it was advised I get the E-visa to avoid entry issues. I was talking to a friend who suggested I check January flight fares, the fares were looking reasonable. 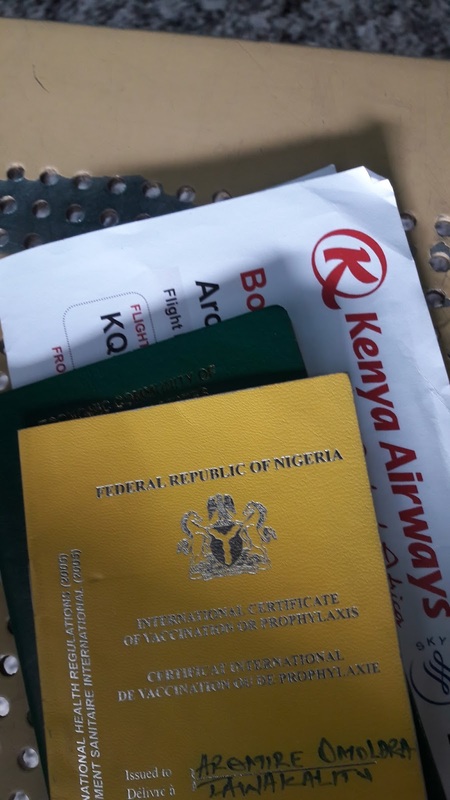 I then decided to apply for my Kenya E-visa which took another 3 days and made reservation on Kenya airways as it was a requirement for visa application. 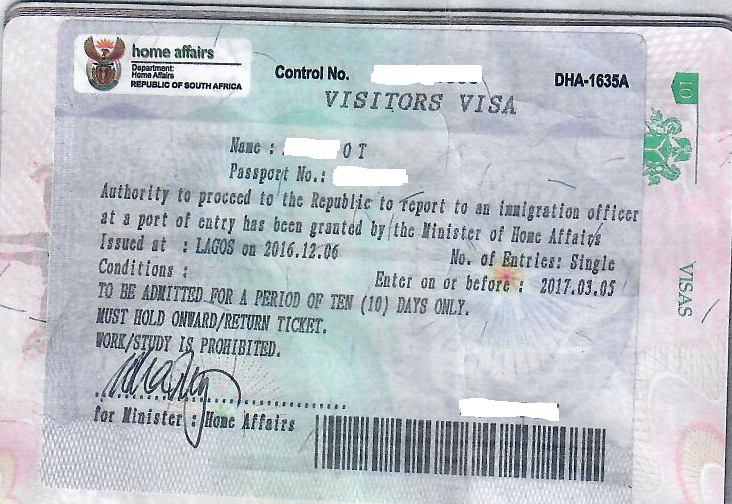 By the time my e-visa was approved, prices for my preferred dates were up to 199 thousand and above again. The trip to Johannesburg was finally confirmed on the 19th of December when I paid for my flight fare. I didn't want to stay in an hotel, this is largely due to the fact that I was travelling solo and all the stories about how tourists are followed from the airport to their hotels and mugged wasn't helping matters. I booked a room on Airbnb and was all set for my trip. Fast forward to my departure date, I departed Lagos for Nairobi aboard the Kenya Airways flight to Nairobi. The flight was uneventful asides from the horrible landing by the pilot at the Cotonou airport and the struggle in-flight food. My seat partner is a Nigerian who has been travelling since 1997, he is currently based in Malawi, deported from Germany and has been to all West African countries. He was surprised I was only travelling for vacation, did not believe I was not going to meet a man or for business. The man next to him is Ghanaian who was living and working in Nairobi and has not been home in years. I had an 11 hours over night stop-over in Nairobi. 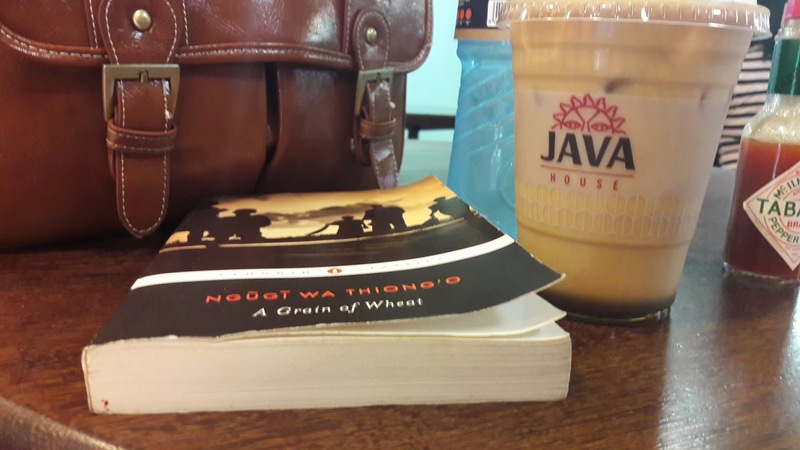 Java House's Iced Latte and Ngugi wa Thiog'o's A Grain of Wheat kept me company through the night. Our flight for Johannesburg did not depart the next morning 1.30 mins after the scheduled departure time. We finally landed at the O. R. Tambo International Airport for 11 am (South African Time). So drama started with my airbnb reservation, immigration officer started with the amount I paid for . accommodation. I paid $48 in total and dude has never heard of airbnb. He asked if accommodation was pre-paid or will be post paid, I replied in the former. He proceeds to call my host's number and when the number did not connect at first ring, he said he would have to refuse me entry. I told him, called the number from Nigeria before I was allowed to board the plane in Nigeria, so how come it is not going through in his own country. The number finally connects and it is the house manager who picks up. So my host is a Belgian who once lived and bought a house in Johannesburg. The house is managed by a South African name Manesi who only gets name of guests and the days to be spent in the house. She has no idea how much was paid or my passport No (actually airbnb doesn't have this information). 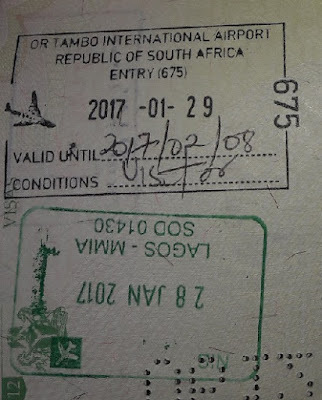 So immigration guy says he is going to have to deny me entry because Manesi does not have this information, She told him the room goes for 250 rand per night and according to Forex exchange rate for the day, that was not correct. He also raised an issue with the way my name was spelt on airbnb, I used Lara instead of Omolara as stated on my passport. I spent over 10 mins explaining that the name is accurate and Lara is just a short form of "Omolara" and this long explanation on how airbnb works. Oga sha still insists on refusing me entry. He said he will issue me a refusal and also give me a 10 year ban. By this time, I was exhausted, hungry and tired. I called my friend's sister who was supposed to pick me up at the airport and explained the situation to her. I was already thinking in my head, how I will just go back to Kenya and see if I could enter on my visa which was valid from the 31st of January or worse get to pay for another visa. She insisted on talking to him and told him to explain what exactly the problem was. He told his long story and she told him, he could not refuse me entry simply because of the the Rand to Dollars rate for the day does not correspond with the rate as at when I paid. She also told him that if he needed to confirm any more information about my accommodation, he is free to go to the address for further confirmation, After a lot of back and forth, 30 minutes after I landed, oga finally stamped me in and allowed me entry in the Sun City. I tell you, I was already calculating wasted money in my head. I was too tired to even fight. End result, I did have fun. Nawa for wahala, ahnahn kilode. I will contact you soon to ask more questions about this your trip. Good thinking Lara and well done for managing the situation well. It would have sacked badly if things went awry. Glad you got in and eventually had a good time. I had to throw all pride aside, besides I was exhausted and too tired to even do otherwise. Wow, that's quite stressful! It sounds like you did a great job of keeping your cool too: my fear of possibly losing my hard-earned money would have frustrated me and maybe affected the outcome! I'm glad it all worked out (I read the latest post). Na wa o. What kind of rubbish is that? When I was going through SA to Brazil, that is how they were disturbing me also, asking what I was going to do in Brazil, and requesting supporting documents. I was wondering what their business is, after all, it was just a fight stopover in their country. They can just be foolish, glad it turned out well sha.